Since my stated goal for this Year of Cake project is a new cake per month, if the planned cake happens to be for a surprise party for someone following along, as happened in April, I’d need a decoy. 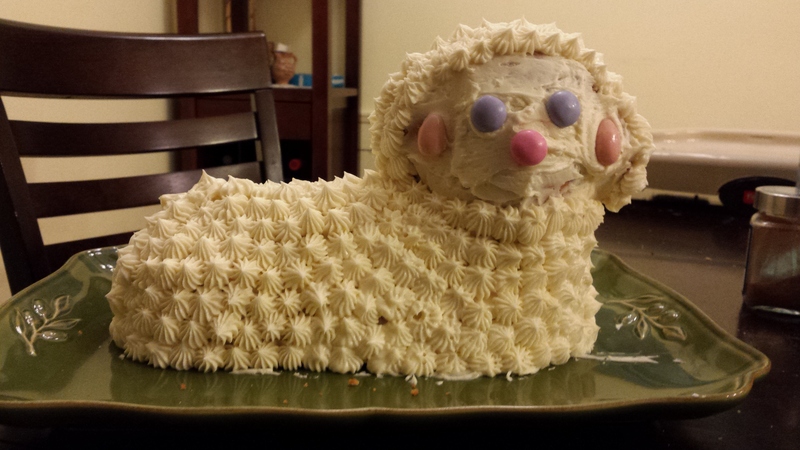 I decided to tackle a cake I’d been wanting to tinker with for years: Easter lamb cake. The finished lamb. White chocolate M&Ms for eyes and nose, and chocolate covered almonds for the ears. I used the white chocolate frosting I love so much, but only because I forgot that this cake usually gets cream cheese frosting. This Polish tradition was a staple in my house, and when I moved out my mom sent a Wilton stand-up lamb pan with me. My mom usually decorates it with a layer of shredded coconut held on with cream cheese frosting, but I like to skip the coconut and use my star tip to really pile on the frosting. Why? Because this cake is dry. Because if it’s too moist, it will fall apart, and nothing ruins a brunch like a decapitated lamb at the center of the table. Most years I can’t make it home for Easter, so I often host a brunch here in Chicago for any friends who happen to be around and hungry, and I always make a lamb cake. This year we didn’t have time or energy to organize a brunch, making it a low-risk opportunity to see if I could moisten the recipe. I looked at a bunch of different pound cake recipes, and they are all remarkably similar to the one from my mom, with the exception that there’s room for a little more butter and vanilla, which I have incorporated into the recipe below. In her description of “Perfect” pound cake in the Cake Bible, Rose asserts that, “Over forty trials have led (her) to believe that there is no way to get this melting texture in a pound cake that is larger (than her recipe, which is 3/5 of the one below) so it is best to keep the cake small.” (p.26). Well, small won’t cut it for this mold, so I stand by my earlier approach of piling on the icing and calling it a (holi)day. Serve with ice cream and mimosas and nobody will complain. Coat lamb mold generously with baking spray. Fill front of mold (the side with the lamb’s face, see picture caption) with batter. 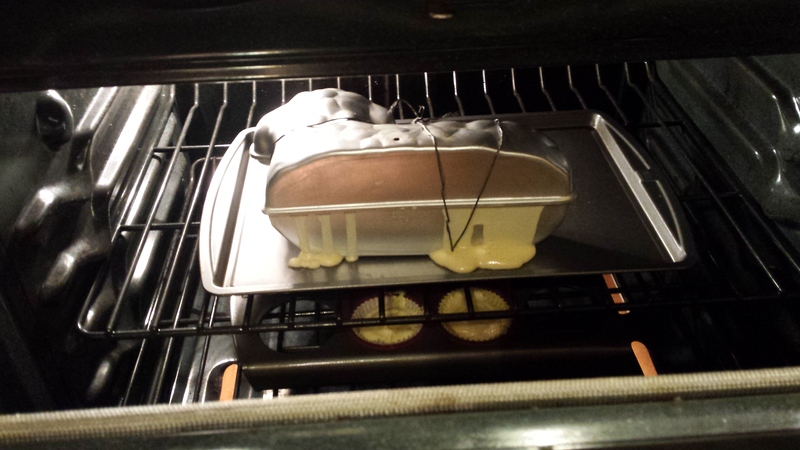 Secure the back of the mold in place with wire or kitchen string to prevent the rising cake from dislodging it, and place face down on a cookie sheet. Bake 325 for 55-60 minutes. Toothpick inserted into the vent hole should come out clean. Remove from oven and let stand 5 minutes without opening the pan. Remove the back and let stand on a cooling rack another 5 minutes. Turn it over (use oven mitts!) and remove the front half of the pan and let cool on rack. It will take about 4 hours to cool completely. Maybe it was the extra butter, but the batter in the back of the pan just leaked right out immediately. THIS IS WHY THIS CAKE SHOULD ALWAYS BE BAKED ON TOP OF A COOKIE SHEET! *Note: These are my mom’s instructions. The Cake Bible’s instructions for the batter are more elaborate and combine the ingredients slightly differently. If this were the Test Kitchen and I had unlimited time and ingredients to compare side-by-side the two methods, I would. This time I used the Bible’s method which, like my mom’s method, produced a cake. A better cake? If anyone wants to try them both and let me know, I’d be all ears. Also note that instead of doing the math to adjust the Cake Bible’s recipe up to the 5-cup proportions, I just made a double batch and made the rest into cupcakes, so I wasn’t quite sure how much to put into the mold (I have since checked Wilton’s web site, which says 5 cups). It didn’t quite fill it (see next picture), but it stood up and looked fine once frosted. 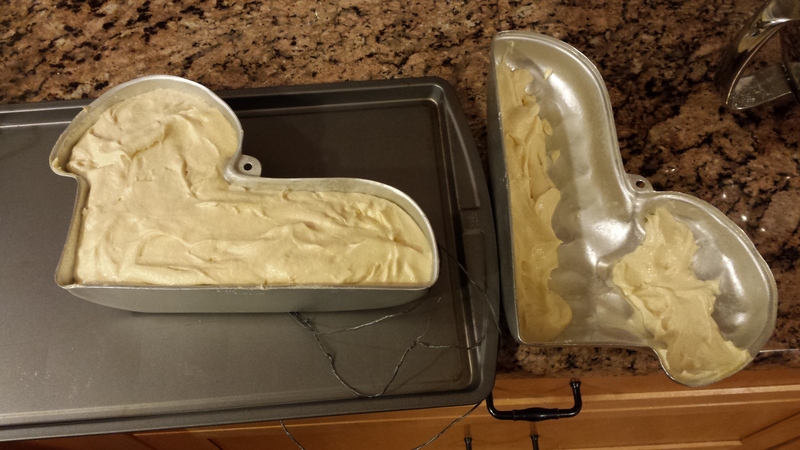 Compare the shape of the pan with the shape of the final cake. 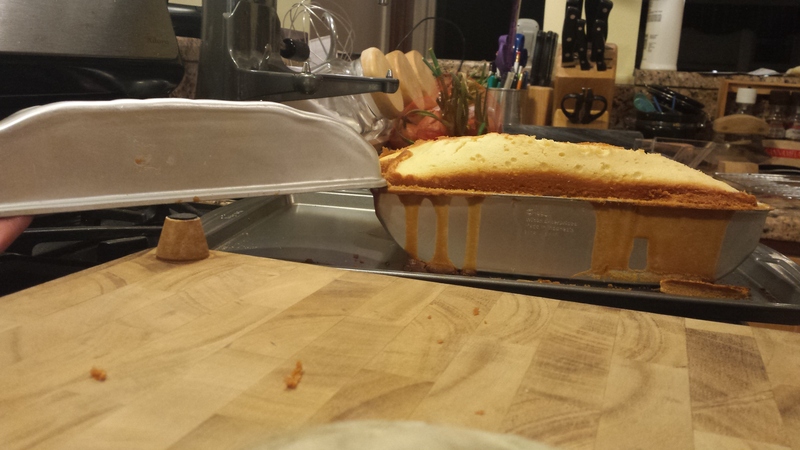 It didn’t rise all the way. Not enough batter? Not sure. But the cake stood up perfectly well, and the frosting filled it out so it looked nice too.